When I first started smoking meat, I was intimidated by big cuts of meat like Brisket or pork shoulders. If you’ve never cooked a big cut of meat before, it can be tough to know what to do, and how to make sure you don’t waste a whole bunch of time and money, only to have what tastes like shoe leather come off the smoker when you’re done. If you’re looking for a Wagyu brisket recipe, or you need a new smoked brisket rub recipe, you’ve come to the right place. 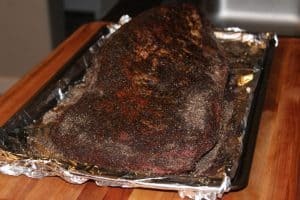 I’ve put in the time to learn how to smoke a brisket, and in this post, you’ll learn all the details. 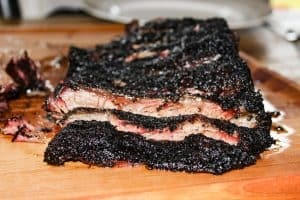 This BBQ smoked coffee brisket turned out deliciously moist and had a wonderful earthy flavor. Looking for something different? Check out my favorite comfort food made on the smoker… the smoked fatty. After reading, if you feel like I’ve missed something, leave me a note in the comments. I am happy to answer any questions you may have about how to smoke a brisket. 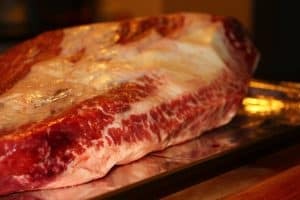 If you’re new to smoking meat, also consider checking out my post about Smoking Meat for Beginners. 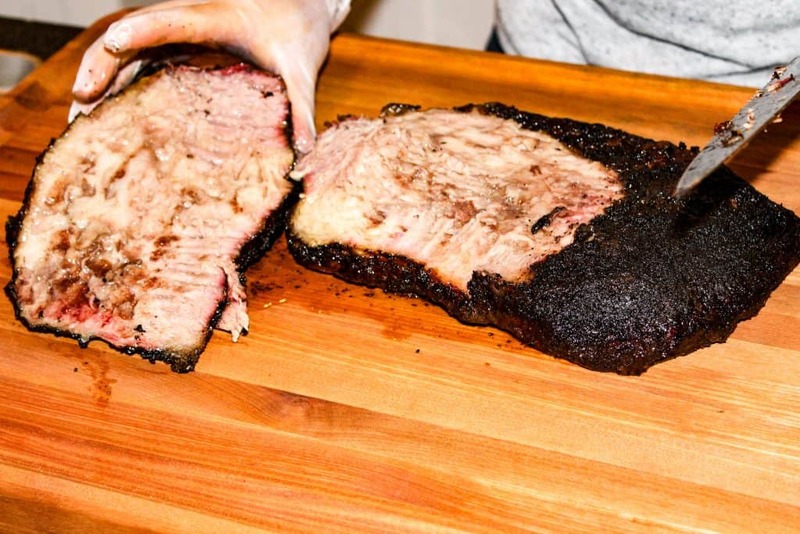 You’re looking at the flat of the brisket, and if you flipped the brisket over, you’d see the point on the far end, connected by a good portion of fat. Take note of those lines of fat on the brisket before you add the rub, and remember to slice AGAINST the grain when the brisket has finished cooking. You may have some extra large fat deposits on one end of the wagyu brisket. This portion of the brisket will also be much thicker than the rest of the cut. 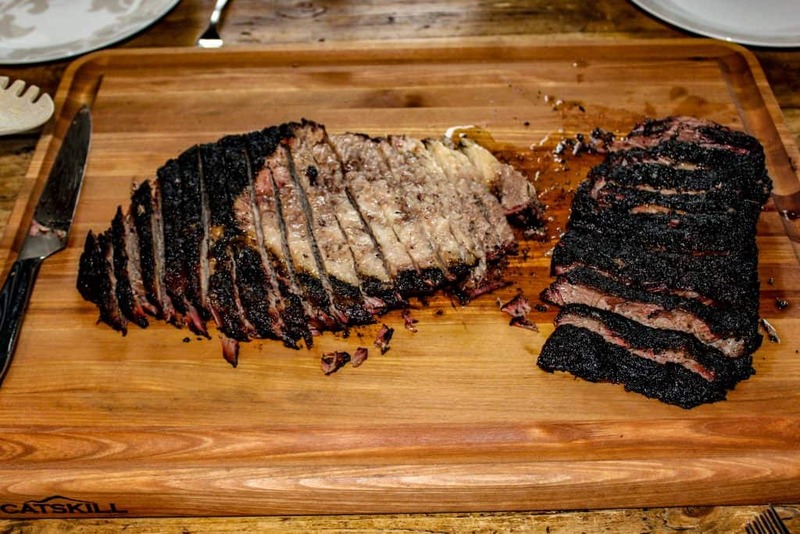 This large area of fat separates what is called the point, and the flat of the brisket. You’ll want to trim most of the larger fat deposits off of the brisket. Leave at least a quarter inch of fat on the meat. 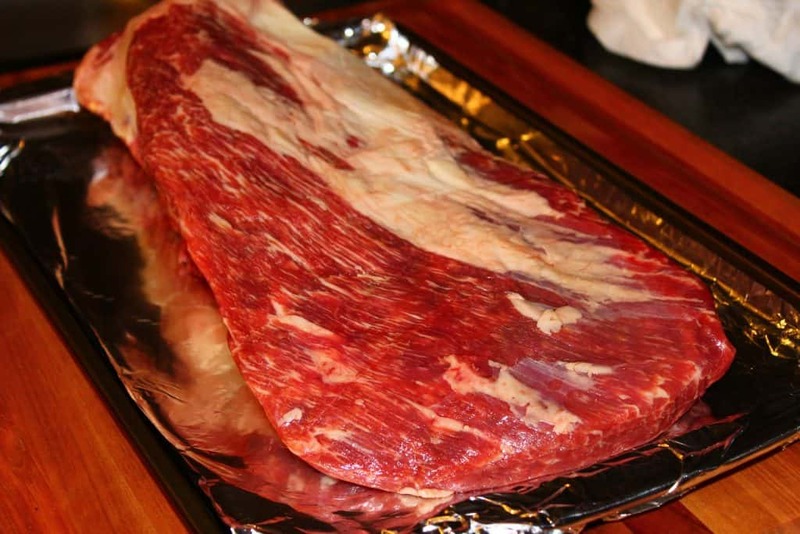 You want to keep some fat on the Brisket to help moisten the meat during the cook. My rule of thumb is that if the fat is hard, remove as much as you can without affecting the meat. If it’s soft, leave it! I’ve done a few cooks where I’ve removed all of the fat cap just to see how it impacted the final result. 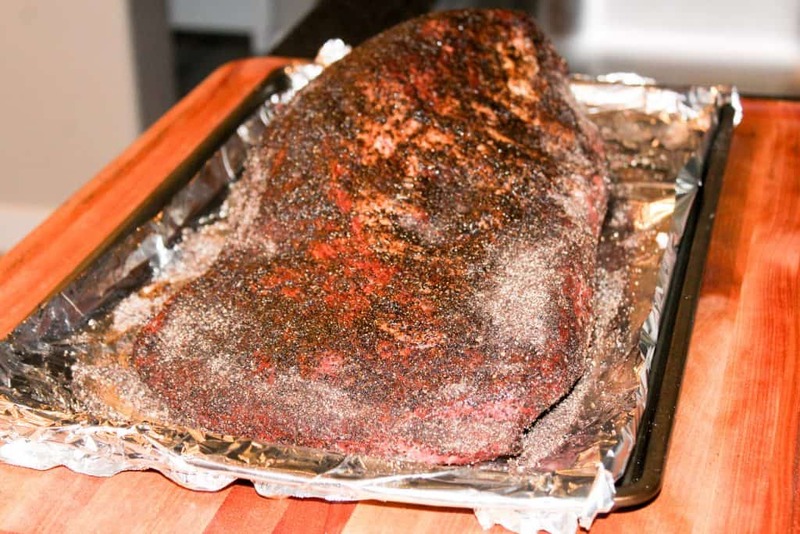 As long as you stick to the plan I outline in this post, the brisket will turn out great! After you’ve trimmed the fat off of the brisket, rub the entire surface with about 2 tbsp of Olive Oil. I like to use garlic infused olive oil, but you don’t have to. 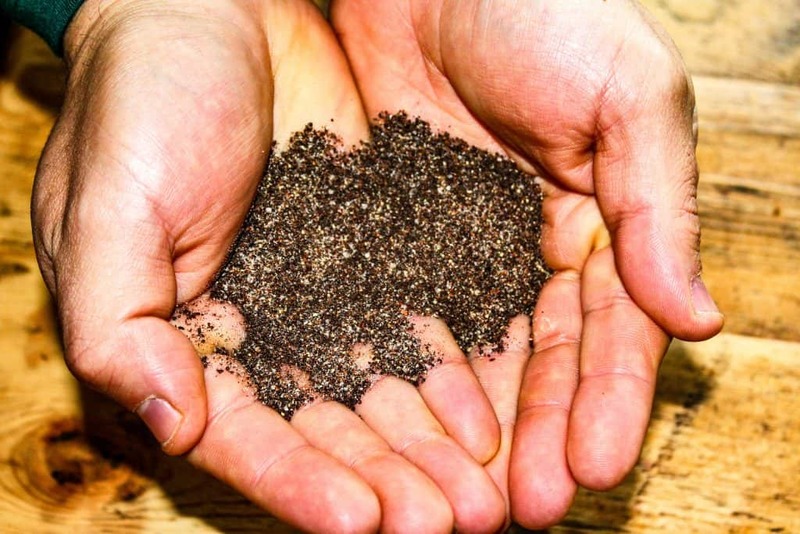 One of the keys to smoking brisket is the spice blend, or “rub” that you put on the surface of the meat. 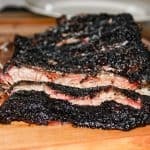 I have developed a rub recipe that is perfect for Brisket and creates a mouthwatering bark every time. This recipe will interact with the meat during the cook to help break down proteins and tenderize the brisket. The rub also helps produce a bark around the outside of the wagyu brisket that is packed full of awesome flavor. Once the meat has been covered with olive oil, cover the entire surface of the brisket with the rub, by gently rubbing it all over the meat. This rub really is the key to my wagyu brisket recipe! We’re getting ready to cook… is your smoker clean? If not, clean it first! Time to cook the Brisket! Turn your smoker on. Once smoke is rolling, get the temp up to 225 degrees. Once it’s at temp, place the brisket on the smoker. FYI, I estimate 90 minutes for every pound at 225 degrees, so you could be looking at 15 hours or more for this cook. After the brisket has been on the smoker for 4 hours put a temperature probe into the center of the thickest part of the brisket, and then check the temperature every few hours. The built-in temperature probes are great for keeping track of what the internal temperature is. I don’t recommend using those to find out if your meat is finished. A Thermapen MK4 is hands down the best internal temperature probe you can buy. It’s calibrated for 99.9% accuracy, and it’s what I rely on when I am cooking for friends and family to make sure my meats come out at the perfect temperature every time. If there is one tool I rely on more than my smoker, it’s a Thermapen. I own a Thermapen MK4 and I love it! When the temperature of your brisket gets up to 160-165 degrees you’ll experience a “stall” where the temp doesn’t go up at all. The stall could last hours. Don’t panic! The stall is normal. Do not panic and increase the temperature of your smoker. Just be patient. It will be ok.
Once your brisket is at the 160-165 degree point, peek on the meat every 40 minutes or so. When the surface of the meat has a dark mahogany “bark” pull the brisket off the smoker, and wrap it tightly with two layers of tin foil. or pink butchers paper. After the brisket is wrapped, put the brisket back in the smoker. Push your temperature probe through the wrap into the meat, and check the temperature every hour until the internal temperature gets to 200 degrees. This wrapping technique is called the “Texas Crutch”. The Texas Crutch is a great method to help push through the stall and retain more moisture in your meat. In some instances, you could lose some bark quality. Whether you crutch or not, is up to you. When the brisket hits 200 degrees, pull it from your smoker, and put the wrapped brisket in a cooler with a towel or two on top of it, and close the lid. Let it rest in the cooler for at least 60 minutes. I usually let my briskets rest for a minimum of two hours. Start smoking the brisket early in the day. It’s ok to start at 4 or 5 am and then go back to bed. If it finishes two or three hours before you are ready to eat, that’s ok. I’ve held briskets in a cooler for up to 3 hours. The longer they rest, the better the juices distribute. Just be sure to not let the internal temperature of the meat get down below 150. 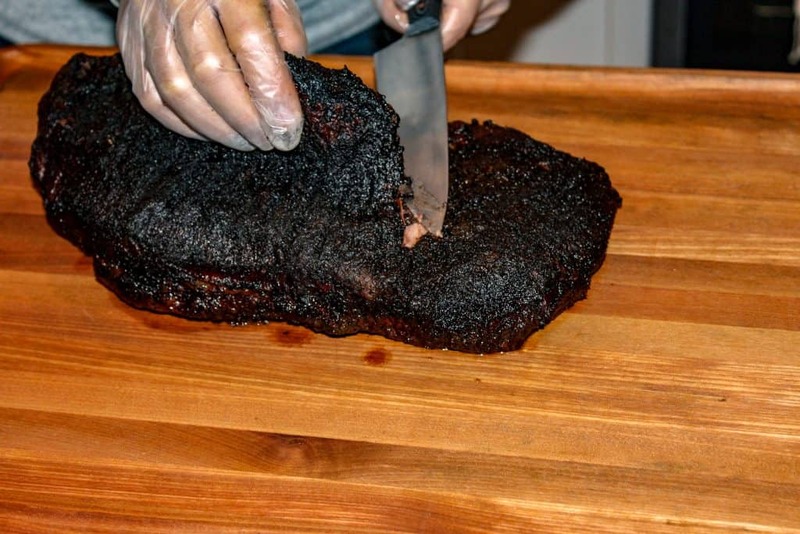 Once your smoked brisket is cooked, separating the point and flat is easy. When you’re ready to serve, slice the brisket against the grain of the meat, in pencil thin slices. The flat will have a grain running in one direction, and the section of meat on top (the point) will have the grain running in a different direction. I separate the point and flat when it is time to serve, and then cut each of them individually. No barbecue Traeger brisket meal is complete without some good sides. My first choice is a delicious salad. One of my favorites is a good wedge salad. Second, you need some good cornbread. If you have the time, make it on your pellet smoker! No need to go overboard here, just buy a packet of cornbread mix at the store and follow the instructions. Serve it warm with butter. Last but not least, serve up some barbecue baked beans, or if you really want to get fancy, three bean casserole! This is a feast your whole family will love. Heck, you’ll have enough brisket to feed the neighbors, so you should probably invite them over too! I hope you’re hungry! A whole smoked brisket can serve a ton of people! Wait, wait, wait! We need dessert too! 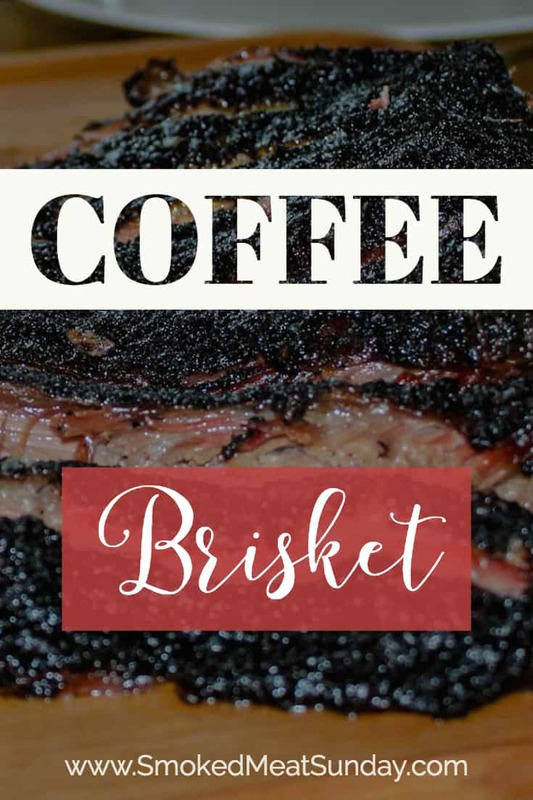 You are cooking a gourmet feast with smoked coffee brisket and your guests deserve dessert before you roll them out the front door! Puff Pastry Turnovers – These are super easy to make. Buy a few sheets of puff pastry from your local grocery store, along with a can of your favorite fruit pie filling. Spoon a small amount of pie filling onto a small square of puff pastry, and then put a similar sized square on top, and seal the edges. Cook on your smoker instead of the oven, and BOOM! 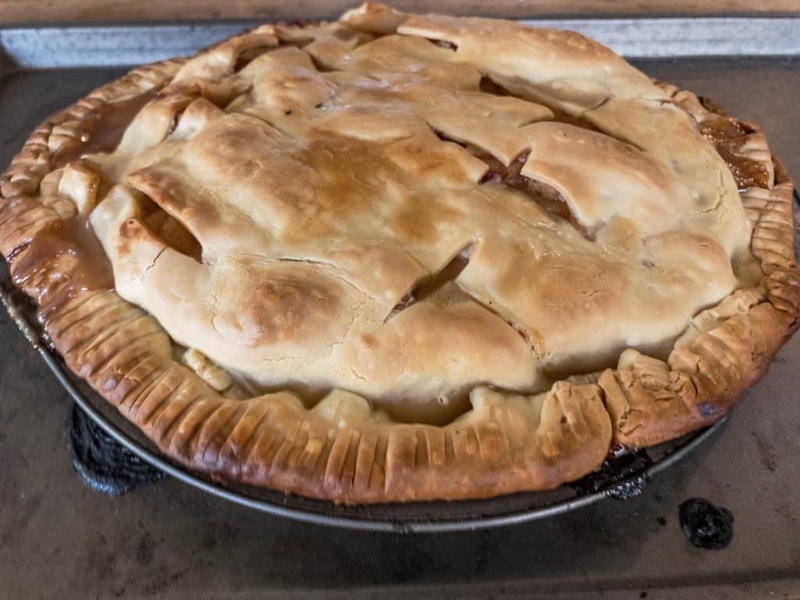 Apple Pie – I’ve made apple pie on my smoker quite a few times now, try this recipe. Your guests will thank you! Smoked Oreo Cheesecake – If you’re looking for something to really take it over the top, this Smoked Oreo Cheesecake does the trick! A Smoked coffee Brisket feast isn’t complete without dessert. Smoked Apple Pie! 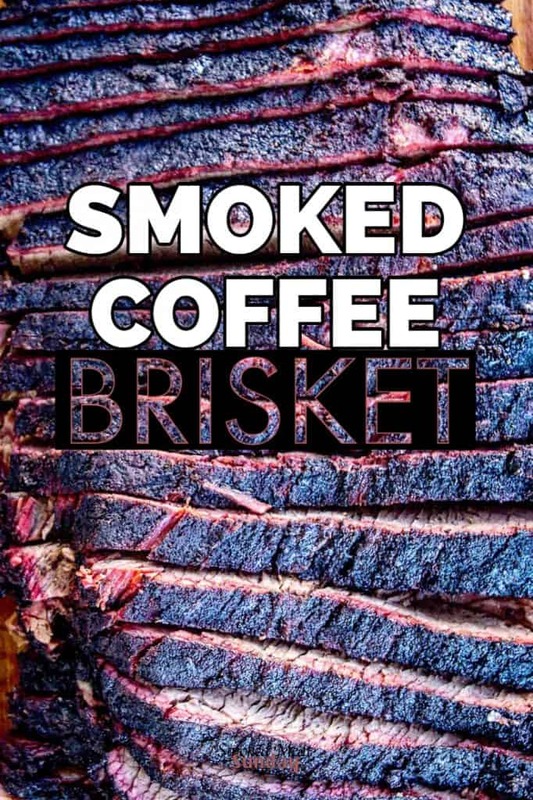 Step by step details for the smoked coffee brisket recipe can be found below. 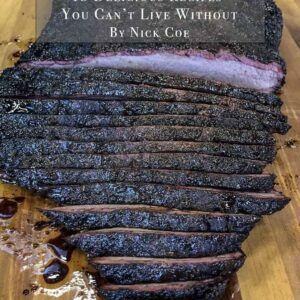 I am so glad you took the time to read this post and learn more about how to smoke a brisket. Don’t forget, if you’re looking for the best source for Wagyu Brisket, check out Snake River Farms! They make it easy for you to get a brisket, whenever you need it. Click this link for more information. Have you cooked a brisket recently? How did it turn out? What kind of challenges do you face when you smoke brisket? Let’s talk about it in the comments! Remove your brisket from the fridge, and trim the fat off the brisket as much as possible, leaving a layer of about 1/4". Take care to not over trim the brisket where the point and flat come together. After applying the Olive Oil the brisket, generously apply the rub to the entire surface of the meat. By this time your smoker should be up to temp. Place the brisket directly on the grilling rack. If you got up early to start this cook, now is a good time to take a nap. After 4 hours check your smoker, and the temp on your meat. When I cook a whole brisket I place a separate probe in the point and the flat. Those two pieces of meat will cook at different speeds, and it's good to know where each of them sit. The magic number you're waiting for right now is 160 degrees. Some people like to go for "look", or "feel" when they are cooking a brisket, but I'm not willing to leave it up to chance when I'm dealing with a piece of meat like this. Once it is up to 160 degrees you have two options. Option 1, leave it alone until the meat gets up to around 200 degrees. This could take a while. Your meat WILL stall somewhere between 160 and 190, and if you're new to this, you will panic that the meat isn't cooking properly. The advantage of doing nothing at this stage is the fantastic bark that will form on the outside of the brisket. Option 2, pull the brisket off the smoker, and wrap it in a double layer of tin foil. Commonly referred to as the Texas Crutch, this will help your brisket push through the stall, and take a few hours off of your cook time. You will sacrifice a little in the firmness of the bark by doing this. When you wrap, be sure to keep your probes in the meat! After wrapping, check the temp on your probes every hour. Once your temp is up to 200, it's time to pull the brisket from the smoker. DON'T unwrap the brisket, it's not done! Place the brisket in a sealed cooler, with towels, and let it rest for at least two hours. 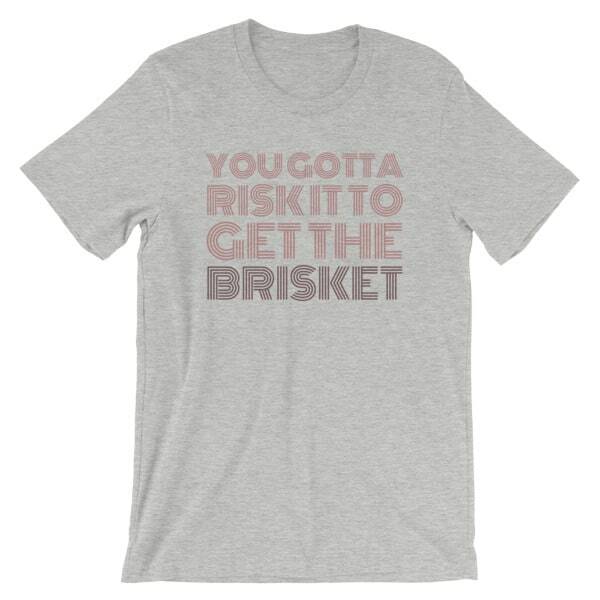 This is a crucial step, and if you don't follow it, you're destined to have dry brisket. Once the brisket has adequately rested, pull it from your cooler, set the table, and then slice it up! Don't forget, ALWAYS slice your brisket against the grain of the meat. This will ensure that every bite melts in your mouth. I never thought of mustard. What type do you use? Dry powder? Wet, yellow, spicy brown, large grain? I have been smoking beef and pork for many yrs and my favorite wood to use is mesqite for beef and apple for PORK. Sometimes I make the dry rub from scratch but more often I buy Adam’s rub and add a bit of oregano and creole seasoning. I finsh it with Jack Daniels GLAZE. Not to be mistaken for Jack Daniels barbeque sauce. The glaze can only be bought from TGI FRIDAYS in half gallon bags but its unbelievable. Hi James, I’ll have to check out that JD Glaze at TGI Fridays. It sounds fantastic! When I use mustard for my binding agent I just use yellow. Recently I’ve started using garlic infused olive oil and it seems to have a similar effect. Totally agree with your wood choices! Hello, just wondering with option 1, do you also have to cover and rest in cooler before slicing or is that only for option 2? You’ll want to cover and let rest with either option. Sorry one more question, is the temperature in celcius or Fahrenheit? No worries! Temp is in Fahrenheit.